Extortion of money, as by blackmail. A thorough search of a place or person. A period of appraisal followed by adjustments to improve efficiency or functioning. I am assuming that blackmail was not the subject of our conversation and that I haven’t inadvertently promised to drop a bag of money in a dustbin somewhere. Similarly, there appeared to be no thorough searching involved … I would have noticed that, so option 3 it is. We will now ‘shake down’ rather than test from this point forward as it removes the pass/fail connotation of ‘testing’ and thereby subtly states that failure is not an option. I think there is a ‘military’ theme running through this weeks post. Essentially the plan is that we will shake down the trailers by towing them in the ’people with bags’ mode rather than the ’cycle tourists’ mode, which should highlight any problems in this area. However, just to complicate matters, we will also be hiring bicycles to get around … just not with the trailers attached. It will be like cycle touring that’s a little bit broken. We are going to hire bicycles from Velo Espresso so that we can have a look around the wonders of Hamilton. Unfortunately, this will mean that when we move from hotel to camp and then back to town, it will have to be done twice – once with the trailers and then again with the bicycles. This is going to be a bit tedious, but I think the benefit of having bikes out weighs the inconvenience. The plan is to take the train to Hamilton with the trailers, thereby shaking them down (not really sure if ’shake down’ can be a verb, but hey ho) in an on/off trains scenario. We will then stay in a hotel for the first night, checking the in/out-ness of the trailers around built accommodation. And finally, we will spend the last two nights on a campground to see how they work with the tent. This will also be a good shake down of capacity because we have just plain cheated on the camping trips we have done to date. Substituting a car for a bicycle enables a few comfort items to be thrown in, just in case … I’m sure you know how it goes. I do think that this is going to be quite a shock for us. My general rule of thumb is that you need the same amount of stuff for a week or a year so packing for 4 days SHOULD mean that we have a bit of space left over. BUT, in reality I think we are going to struggle to get everything in the trailers, even though they seemed quite large when they arrived. This trip will also shake down camping in cooler weather. So far, our trips have been during lovely warm temperatures but the night are getting cooler now and I am a little concerned about being warm enough. Last time I had a cold head and shoulders during the night but hopefully I have fixed this with the addition of a few specialised nightwear items. My previous nightwear was not very ‘outdoorsy’ shall we say. This this time I am taking a beanie (not the bunnies sitting on your head version as I haven’t started knitting this yet) and some pyjamas. I picked up the pyjamas in the Smith and Caughey sale and they are THE perfect camping PJs. 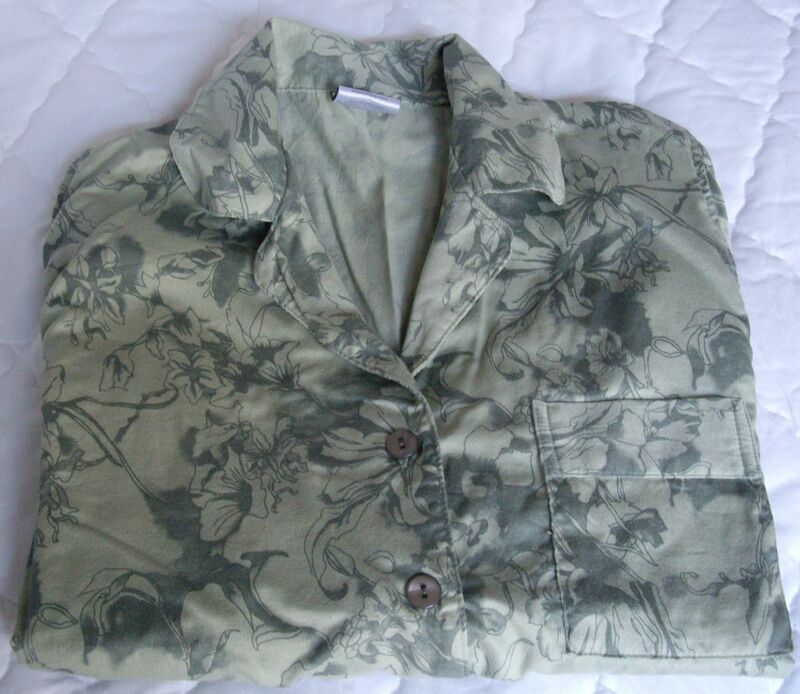 The fabric is green with grey flowers and is almost a styley version of the camouflage fabric that army types wear. I will blend into the environment beautifully and with the added benefit of being primed and ready in case I fancy a bit of bird watching on the way to the bathroom block or the campground is suddenly invaded. I don’t know whether soldiers wear pyjamas but if they do, these would be perfect. Other new equipment includes a couple of down puffer jackets for the Husband and I. 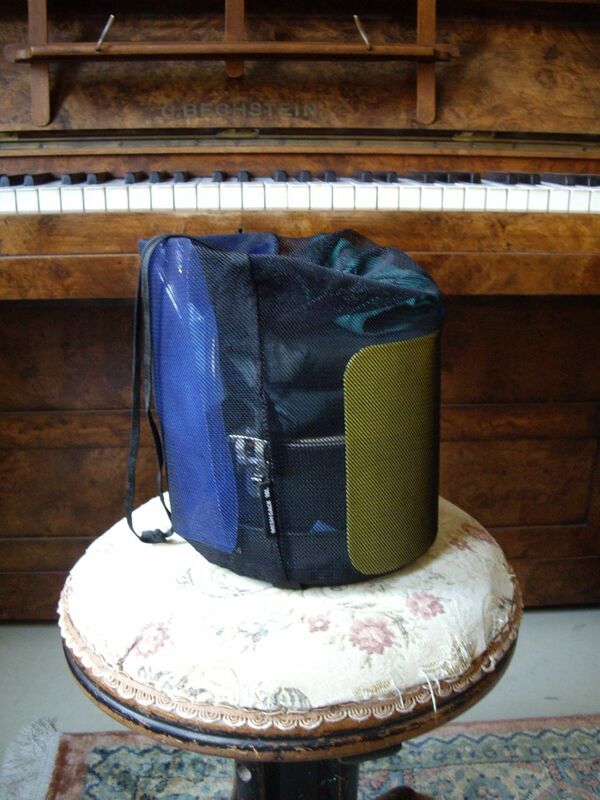 They pack very neatly into one of their pockets, are very light and provide a good level of warmth. The outdoor shops are having their last big sales push for the Easter break trying to clear last years stock before bringing in this years new winter gear. We bought both jackets at a very good price but are consigned to having to live with the stigma of wearing last years styles … somehow I think we’ll cope! 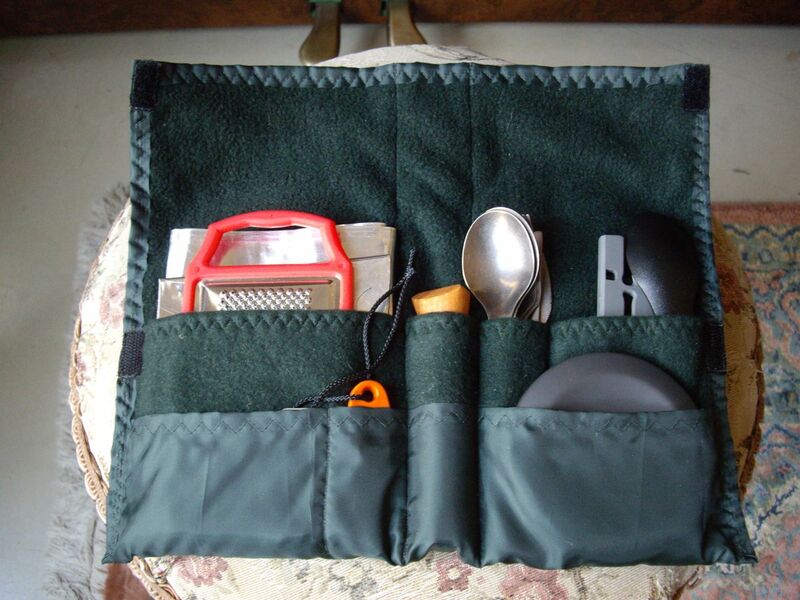 I have also minimised our ’kitchen’ by discarding all of the separate pouches, pockets and bags that the equipment came in and integrating them into the smallest space possible. I have also resolved the cutlery issues from our last trip by making a utensil role that hold all the bits and pieces for cooking in one place. Hopefully this will work well, create efficiency and reduce the chances of losing bits along the way. We shall see. the Husband’s pillow, so all hell might break lose! I find the 3 legged foldable camp stools great as they are light, small and fold. Bike lights make good camp lights. Yes, I have seen those stools and this may be what we end up with. The ones I found that were uber light weight come from America so I don’t know whether we will be able to get them. I had also planned on using a bike light around camp (preferably a solar charged one if i can find one) but I think we are planning to get the dynamo charged lights for the Bromptons so they will be fixed to the bike. This will mean having an extra bike light (which isn’t a bad thing) for use around camp. Thanks for your comments. If you know of any solar charged bike lights please let me know – it’s on my ‘research list’ at the moment.